Barcelona held on to their five point lead at the top of the La Liga table with to a 3-0 victory at home to Eibar, as Lionel Messi scored his 400th goal in the competition. Along with Messi, striker Luis Suarez scored a brace to give the Blaugrana a comfortable victory, returning to winning ways after suffering a surprising defeat in the first leg of the Copa del Ray round of 16. Eibar started the game well, frustrating the hosts by not allowing them to play out from the back and dictate possession. However, ​Barcelona demonstrated their superb quality for the game's opening goal after 18 minutes. A delightful passing move between Philippe Coutinho and Suarez allowed the Uruguayan to curl the ball into the bottom corner. The visitors managed to keep Barcelona at bay, but it was only a matter of time before the Catalan side ran rampant, scoring two goals in six minutes. First, Messi reached his landmark goal with a driven shot across Eibar goalkeeper Asier Riesgo before Suarez scored his second with a wonderful finish at the near post. Already La Liga's record goal-scorer, ​Messi further etched his name into footballing history with his 400th goal in Spain's top flight. Lionel Messi has now scored 4️⃣0️⃣0️⃣ La Liga goals. Widely regarded as the finest player of his generation, what is all the more impressive about Messi's record is that he has achieved the feat of 400 goals from only 435 appearances in the competition. Overall, this win was an important one for Barcelona after their midweek loss to Levante in the Copa Del Rey, which the players will be hoping to atone for in the second leg on Thursday. Starting XI: Ter Stegen (7); Roberto (7), Pique (8), Lenglet (8), Alba (7); Rakitic (6), Busquets (6), Arthur (6), Coutinho (8); Messi (8), Suarez (9*). Substitutes: Vidal (7), Dembélé (6), Semedo (6). 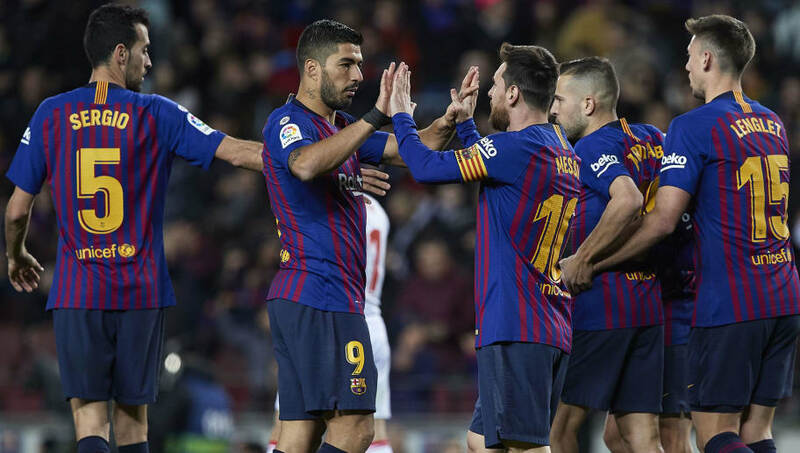 Scoring two and assisting another, ​Luis Suarez produced a fine individual showing in a game where his partner in crime Messi will receive all the plaudits for his landmark goal. Suarez's second was a particularly fine goal, as he fired home at Riesgo's near post following a quickly taken throw-in. Despite Messi reaching his personal milestone, an exceptional performance by Suarez, who scored against Eibar for the sixth game in a row, should not go unnoticed. After being shocked by Levante, Ernesto Valverde's players gave a timely reminder of the quality they possessed in what was almost a flawless team display. Ivan Rakitic in no way gave a bad performance, however he was the poorest among Barca's players. He seemed unfocused at times and was dispossessed of the ball in his own half on several occasions. Rakitic Never Had An Impact In This Game But This Coach Won’t Take Him Out. Rakitic was himself. Offered what he always has. Average. The Blaugrana return to action on Thursday, for the second leg of their last-16 Copa Del Rey tie against Levante. They then return to ​La Liga action next Sunday, hosting Leganes at the Camp Nou.